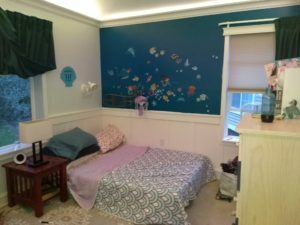 I completed a Board & Batten wainscoting project in my daughter’s room this weekend. Well, almost completed: I have some touch-up sanding/painting to do, but that’s only an hour or three of work. I had planned on doing two walls, but Home Depot didn’t have enough panel board so I only did one plus the head of the bed. But two walls presented a challenging math problem. How do you get similarly spaced battens that don’t run over wall outlets? The answer was to put together a little Excel worksheet that does the calculations for me. Here’s how it works: open the sheet and enter in values for everything highlighted yellow. Most of it’s on the summary page, where you enter the width of your batten molding, as well as the length of each wall. Then you need to visit each wall sheet and input the location of any wall sockets. You can also give each wall a more descriptive name if you’d like. With that information, go back to the Summary sheet and start changing the number of battens on each wall. You want the opening widths on all four walls to be relatively similar. No one will notice if they’re half-an-inch different, but several inches different will be noticeable. More important, if the Socket Errors column turns red, it means that one of your battens will cross a wall socket. Obviously, you can work around that, but I find it challenging enough to cut socket holes in the wall panels correctly. I don’t want to have to do crazy cuts on the battens.